State via Sentence C-350/94. Secularism consists in separating political and religious or ecclesiastical powers when it comes to putting into practice the State roles and functions, thus prohibiting religious matters from interfering with the government and vice-versa. This implies the Colombian State not to adhere to any religious denomination or creed whatsoever, and to remain neutral regarding each and everyone of the world’s spiritual cosmovisions including the lack thereof. It also implies that, whenever performing its tasks, the State must be equitative before any religious or spiritual practice or their deliberate absence. A State is confessional when it is its own constitutional politics to expressly be attached to a specific religious creed. In view of the above, Colombia is a Secular State, non-confessional and with some secular political practices derived from the Christian/Catholic view of the world and society. There is, however, a strong tendency for state functions to favour a Christian Theocracy. When state secularism is not overlooked or unknown, it is intentionally breached by a number of public officers who abuse their positions of power to impose their particular religious practices directing public funds towards rites and cults rather than towards pressing matters such as health, education or the environment. A heightened risk thus emerges for the little steps taken with the 1991 Constitution to yield to a political retreat towards a state which may become more openly theocratic. 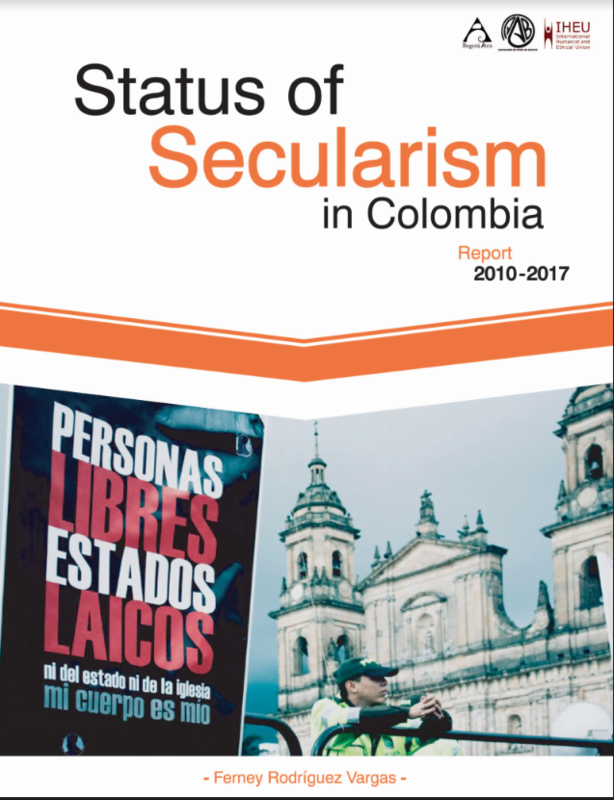 The chief purpose of publishing ‘Status of Secularism in Colombia (2010 – 2017)’ is to compile in a single instrument all the available information related to the church/state separation stage in Colombia. This publication aims at providing precise and trustworthy reference sources to researchers, journalists, defenders of secularism and human rights, agencies, organisations, institutions and affiliates. This is the first report on the matter made in this country, which is why there is a deliberate intent to present the best coverage related to the separation of church and state and how it materialises in the following aspects: legal status of Secularism, political participation of churches, political debates, religious imagery in public institutions, public resources, freedom of speech, education and SRHR. In all of those aspects, secularism has permeated in different extents, with instances of progress and setbacks alike. In order to accurately analyse such a phenomenon, a grid has been put forward assessing each aspect in four categories: critical, deficient, fair and firm, each with a scoring range which will allow for yearly results to be compared and to rate different national territories in the region. Out of 50 possible points, a state is deemed fair between 36 and 45, deficient between 13 and 35 and critical between 0 and 12.